Once John and I had decided we were getting married, I was determined that our wedding would be nice, but not overly expensive. It was just one day, and the most important things to us were the Mass and being able to invite the people we loved. One day even before we were engaged, my phone rang at work. It was my mother. “Don’t be angry,” she said. And just like that, we had our bridesmaid dresses. That’s how we approached the whole planning process—looking for elegant but affordable, splurging on things like an Irish harpist for the reception and telling my younger brother that his car would be serving as our limousine. I looked everywhere in Baltimore for a reasonably priced reception site, and I finally came across the Sullivan Room, a beautiful space at St. Peter’s in Libertytown, Md. It was a bit of a drive—40 minutes at a good clip—from the Cathedral of Mary Our Queen, where the Mass would be, but it was exactly what we were looking for. It was full of sunlight, had plenty of space for our guests and a dance floor, and it was named Sullivan, an important family name. 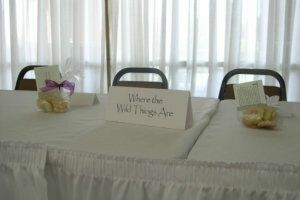 I shopped around for caterers without using the word “wedding,” and we found one that was very accommodating. One of my close college friends was a pastry chef, and she offered—or maybe I begged her—to make our wedding cake. She drove down from New York with the cakes and assembled them the day before the wedding. 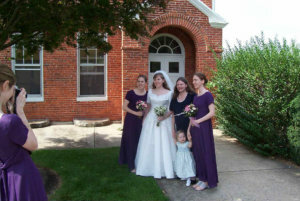 Instead of filling the Cathedral with large floral arrangements that would vanish in that huge space, we just had flowers for the bridesmaids, the flower girl, and me. The bridesmaids may have spent a fortune on alterations, but they looked lovely in their $8 dresses. My wedding gown was just what I had wanted, simple and with short sleeves, discovered on the clearance rack at a shop in Fell’s Point. 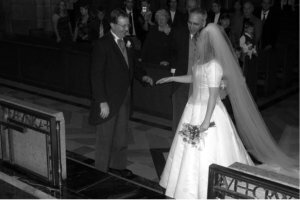 So much of what I loved about our wedding was how personal it was. My cousin Susan made my veil. One of my friends from high school sang at the Mass and we had family and friends involved throughout the ceremony. We named every table for a location in a book, and I cut hydrangeas from my parents’ yard to place around the Sullivan Room. My father baked cookies, and we placed them in 20 baskets we found at the dollar store—baskets we still use all the time. This weekend, as I was digging through my wedding planning folder, which I found recently, I realized we had crab dip at our reception. I have no memory of that, though I have no doubt it’s true. I do remember the chicken Marsala and the cake—ah, the cake—which was so, so delicious. The DJ was fun as we danced our first dance to “Can’t Help Falling in Love” by Elvis, the company was amazing, and the day went by much too quickly. In the end, we were married and starting our life together. Now and then I wish that we had spent a little more on photos of the day. Maybe, just maybe, I should have stretched the budget a little for better photography. The photos we paid for are so disappointing. But you only need so many photos of your wedding. And when expenses have come up in life since, as we saved for a house, or saved to travel twice to China to adopt our sons, I have always been happy we didn’t put more money into one day—memorable though it was. 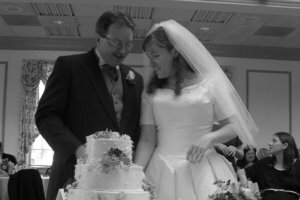 When I think back on our wedding day, all I can remember are the people, smiling all around us, and my husband, enjoying it all at my side.